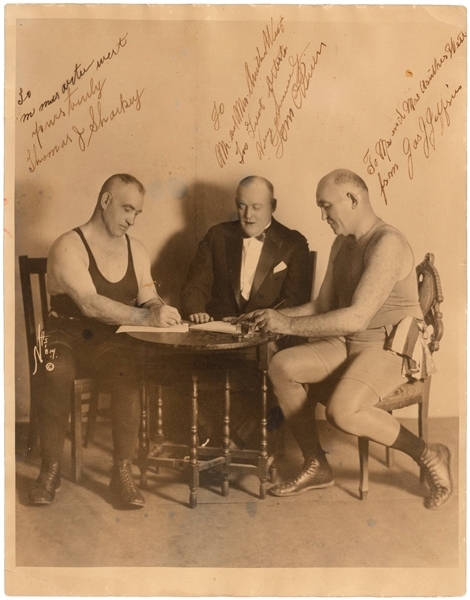 Oversized 11x14" vintage publicity photo showing boxers James Jeffries (1875-1953) and Tom Sharkey (1871-1953) in athletic wear later in their careers, seated at table signing papers as Tom O'Brien looks on. Jeffries had a title match against Sharkey earlier in his career, breaking Sharkey's ribs and winning the fight after the pair went the full 20 rounds. 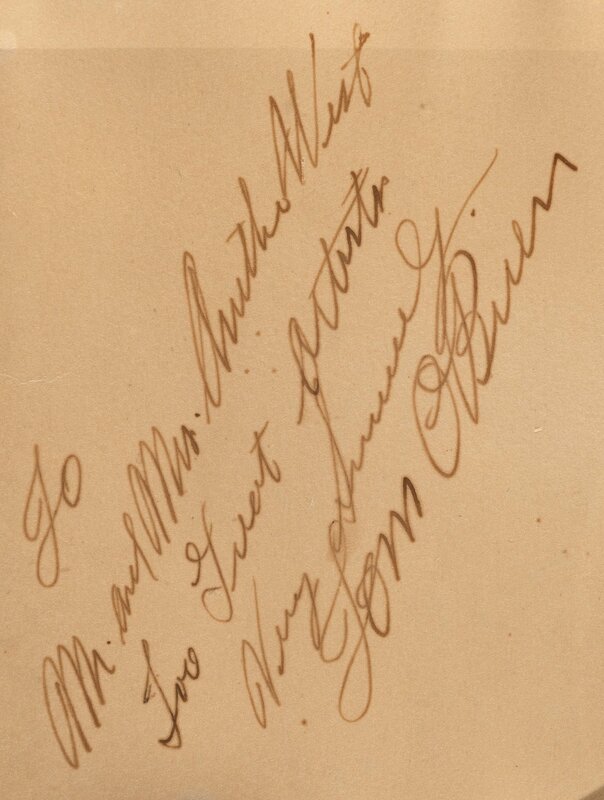 All pictured have signed photo in black ink, each inscribing "To Mr. And Mrs. Arthur West." Signatures have aged, but all remain distinct. Photo has even moderate aging w/rippling to top margin and faint streak of moisture below Sharkey's hand. Lower left has 1.75" corner crease.Still displays Fine overall. Comes with One Of A Kind Collectibles and JSA LOA Jeffries & Sharkey had fought in a hotly contested 20-round slugfest on May 6, 1898. The decision went to Jeffries in a close fight. Nevertheless, Sharkey vowed to beat the 6'2½ burly Jeffries in the rematch. The two fought a memorable twenty-five round bout on November 3, 1899 in Coney Island, New York. The match was the first championship fight filmed for motion pictures, and was first indoor fight successfully filmed. The lights required for the filming were so hot that they burned the hair from the top of both fighters' heads. The last round of the fight was not recorded, however, because the camera operator ran out of film, although, the version of the film that was hidden inside a cigar box. The fight was a ring classic. Sharkey took the early lead when he battered the larger Jeffries during the early stages of the bout. 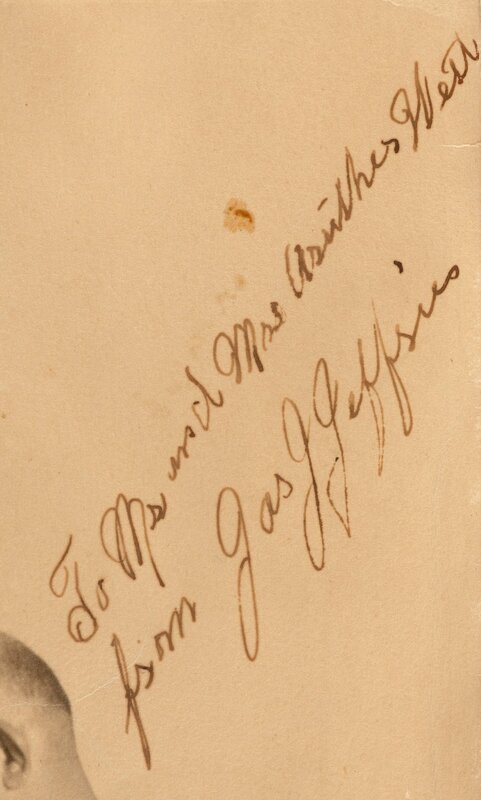 Jeffries, however, was very powerful and gained control of the fight in the later rounds. Both fighters, despite suffering severe injuries during the bout went all out in the final round, which most believed was won by Jeffries. 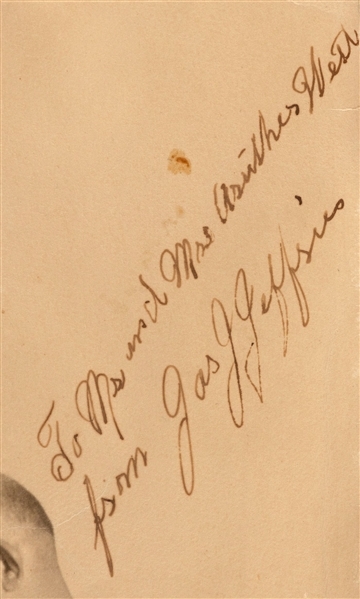 In any event the bout was awarded to Jeffries. 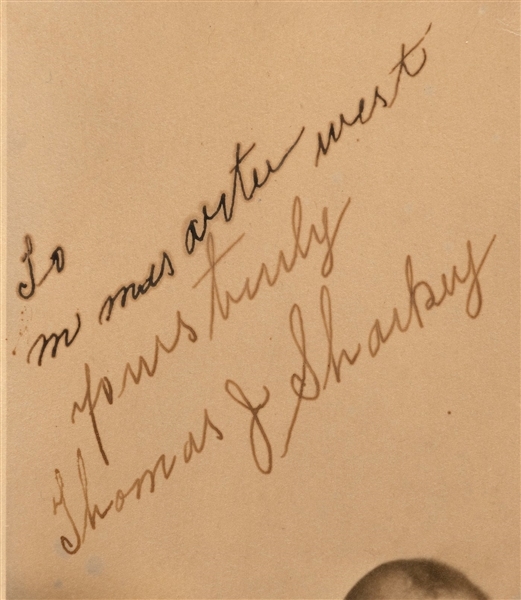 During this fight the indomitable Sharkey suffered a broken nose and two broken ribs, and his left ear swelled to the size of a grapefruit. After this fight Jeffries and Sharkey became friends. Jeffries always claimed that Sharkey gave him his hardest fights stating that Sharkey was the roughest, toughest and bravest man he ever fought.